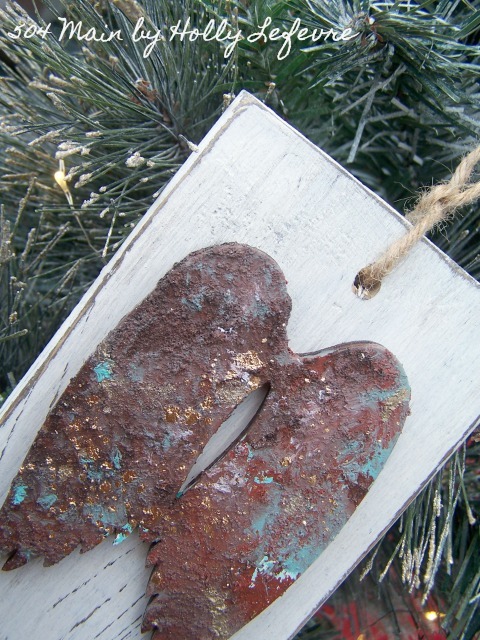 Funky, rusty ornaments are my thing this year. 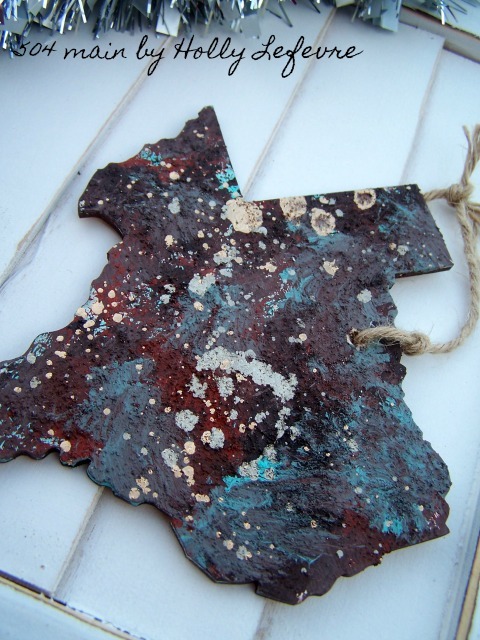 I have been using this same technique on some larger Texas shapes (made from wood) and people have been buying them like crazy! 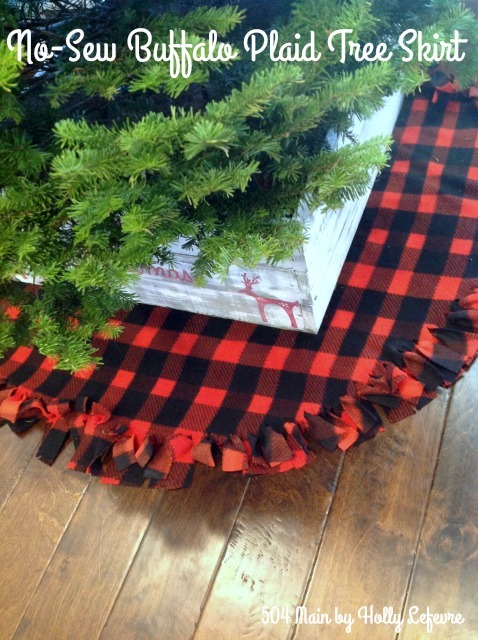 I thought this was a perfect application to mix with my past rustic wood ornaments and burlap banners on my tree...and they will look marvleous with my Buffalo Check Plaid tree skirt...I see this years "theme" emerging! 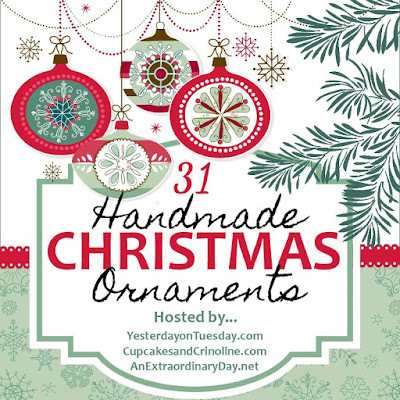 For the last few years, I have been lucky to participate in the 31 Days of Handmade Ornaments Party. 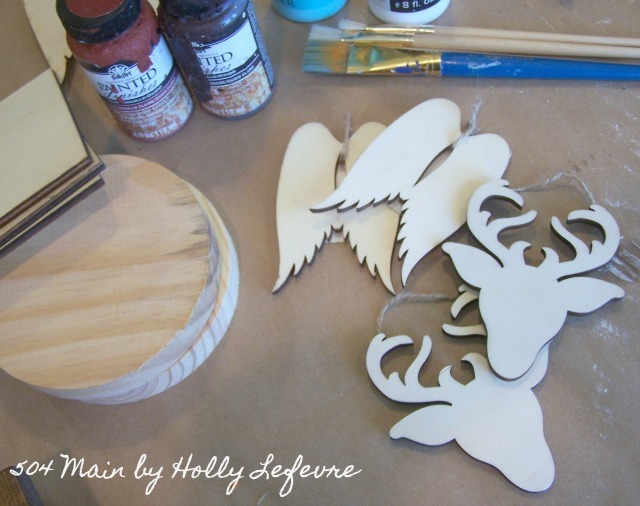 I love seeing the creativity and uniqueness of the bloggers ornaments and it gets me ready and moving on making my own Christmas ornaments. 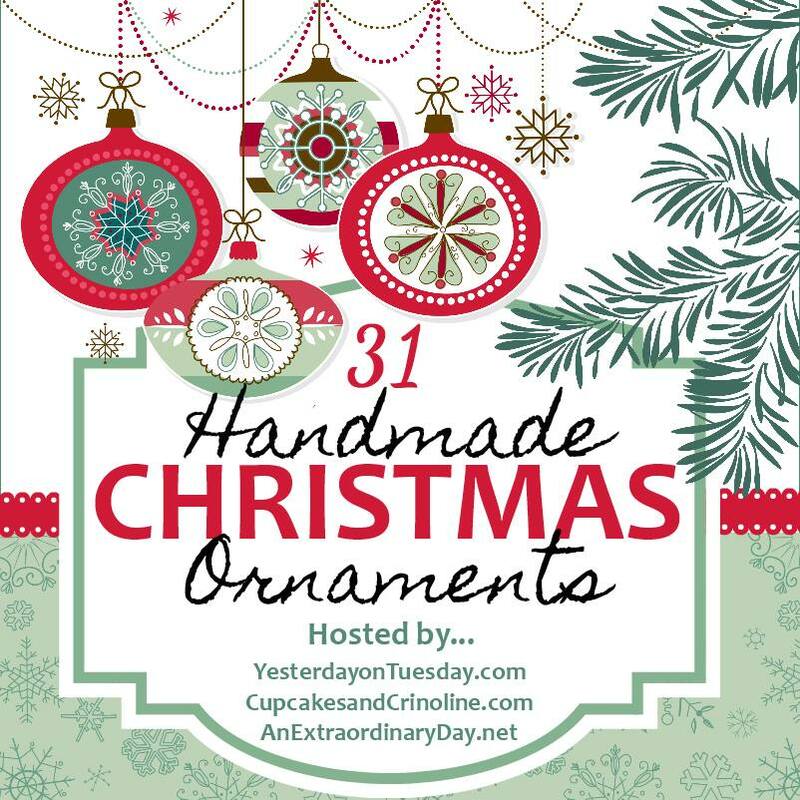 This year I am day 16...so there are already 15 fab ornaments posted and 15 more to come! Be sure to visit the Pinterest Board for more ideas and inspiration! Optional: Round or square wood scraps (see directions). I say optional becasue my intention was to use only the shapes for my ornaments, but then I attached a few to some shapes and fell in L-O-V-E. Paint brushes: The ones for the rust past can be old, icky, and cheap. For the paint you can use which type of brush you would like. MAKE IT! 1. Cover your work surface and wear gloves if desired. 2. 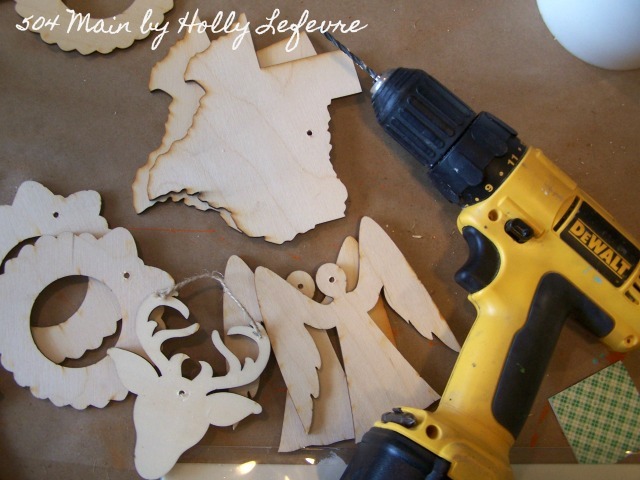 Drill a hole in the wood shapes for hanging. 3. Paint each shape the base color, white, let dry. IT DOES NOT HAVE TO BE PERFECT. 4. 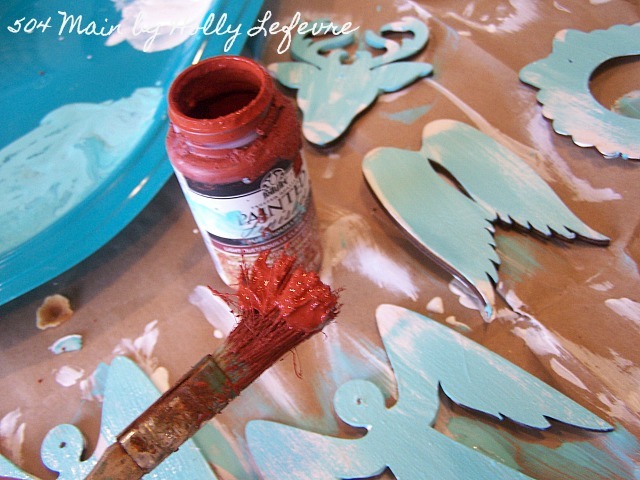 Paint each shape the accent color (DecoArt, bahama blue) let dry. IT DOES NOT HAVE TO BE PERFECT, let the white show a little. Let dry for a few minutes. 5. 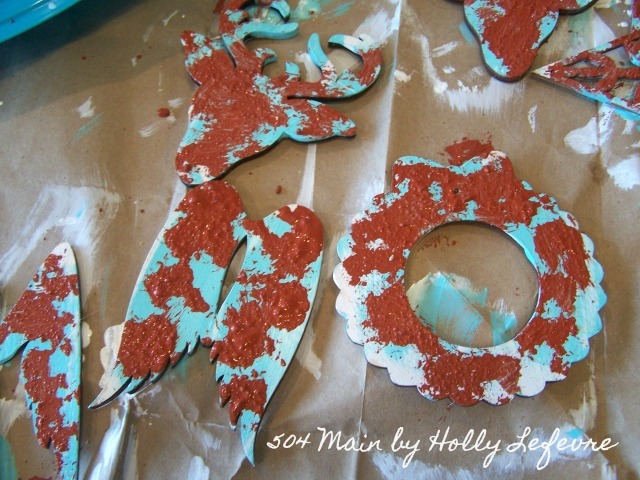 Use the lighter rust past and one of the junky paint brushes and "pounce" the rust paste on the ornament. 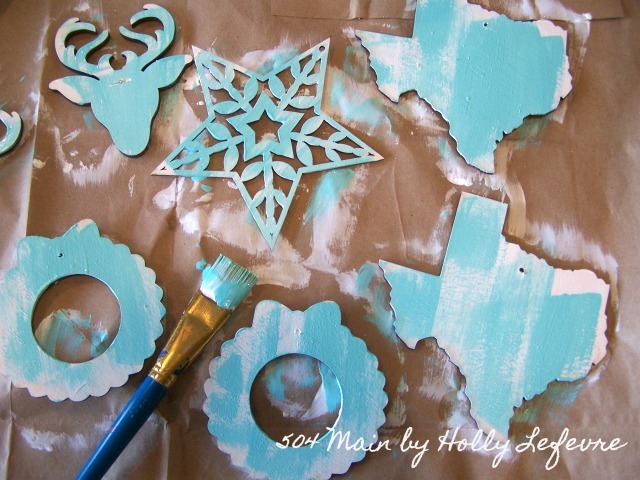 You do NOT need to cover the entire ornament...leave the base paint showing. This can get messy! TIP:do not put too much Rust Paste on your brush. Play with it first on a scrap piece of wood, etc. to see how it applies. 6. 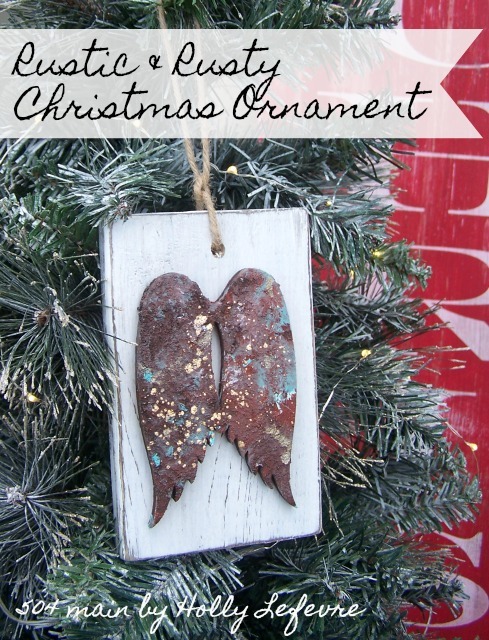 Use the darker rust past and one of the junky paint brushes and "pounce" the rust patste on the ornament. You wil be pouncing on top of the paint and the first rust paste color. You want them to mix and overlap. 7. Take another (old/junky) brush and pounce all over, essentially blending the rust pastes together and making seamless transitions with the base paints. If you want, grab some of the base and accent colors on another brush and lightly dab on top to bring some more color forward. Let dry. 9. 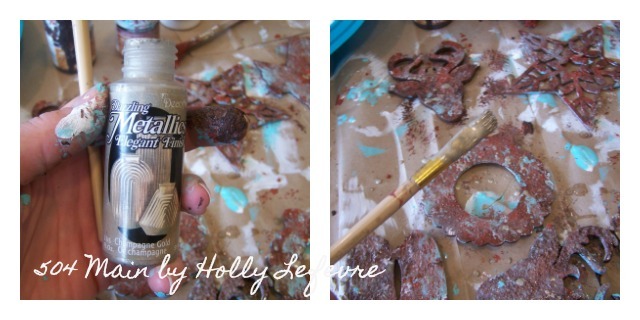 I repeat step 8 using the Martha Stewart Gold Gilding - it gives a really luxurious look. 11. Thread a length (about 12") of twine/ribbon through the hole and tie at the top. 12. 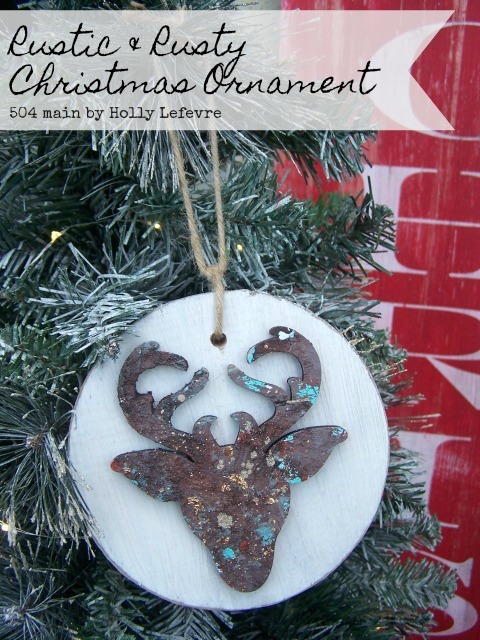 You can also mount the rust ornaments to a plain wood block (I have a ton of scraps from past projects) or to wood disks I found at Michaels. The round disks were about 99 cents! This photo was taken prior to finishing the shapes. 12-A. 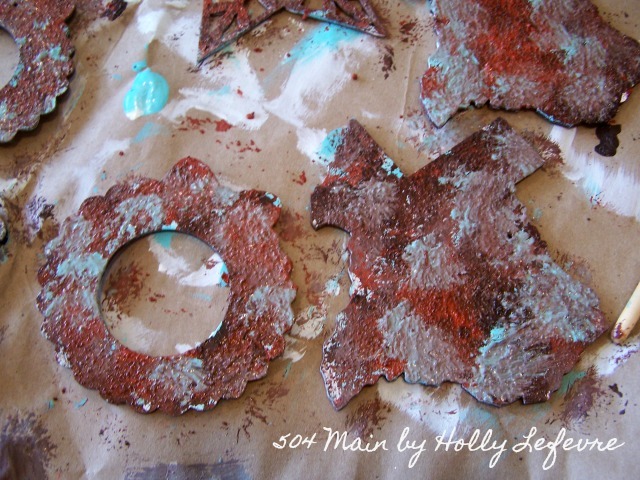 After I painted and rusted my shapes, I let them dry completely. 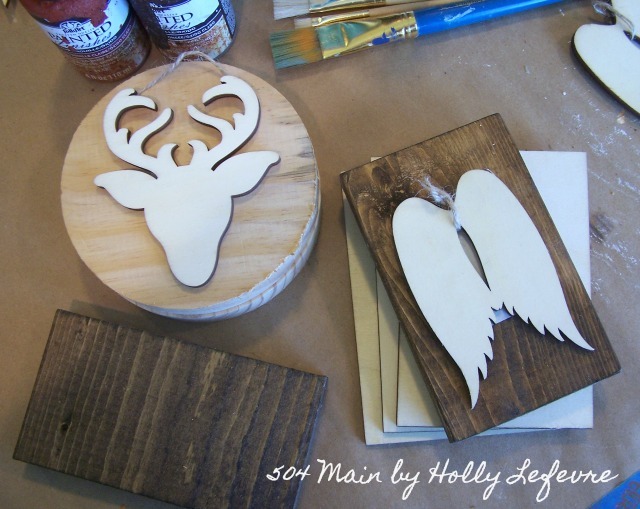 Then is placed them on the wood shapes, which I painted white and sanded and drilled a hole in. I affixed the shapes to the wood blocks with E6000 glue. 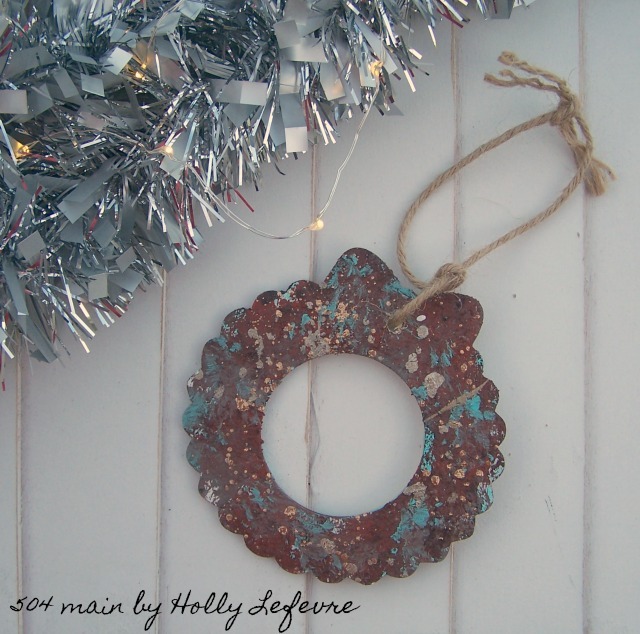 And there you have gorgeous faux finish rusty ornaments. I promise they look so good. At the last craft maketplace I sold at, people were amazing these were wood! And you can use all different shapes! 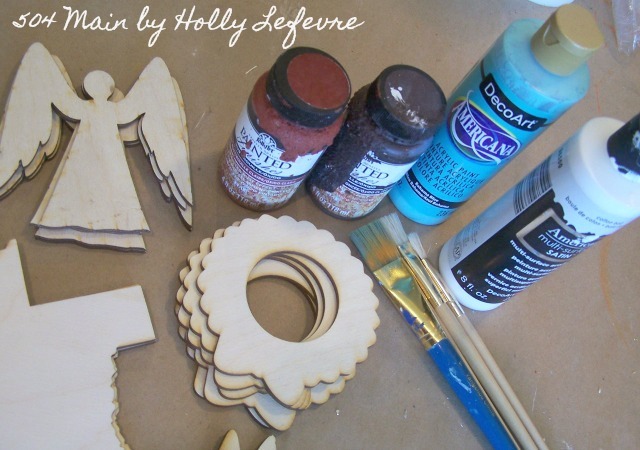 So, are you ready to make some amazing handmade ornaments!? Every year that I particpate in this ornament blog hop, I am more and more amazed and the unique ornaments. Be sure to check them all out. Here are all 31 Bloggers in order of their appearance! Be sure to visit Inspiration for Moms tomorrow! 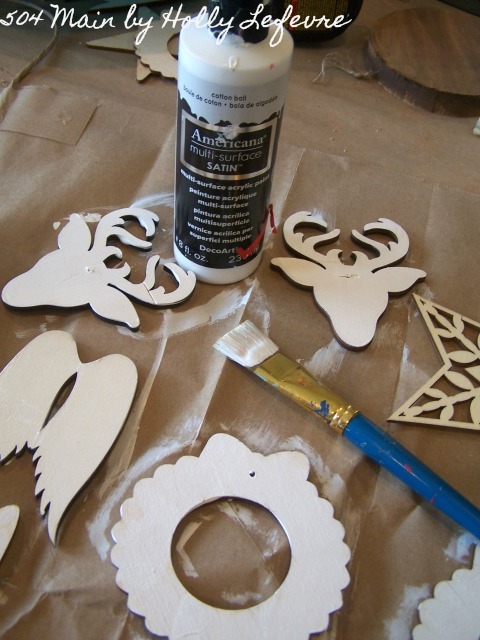 Will you be making Christmas Ornaments? Which ones!? I LOVE the rusted look of these ornaments. I think the star is my favorite. Pinned! I love your rusty creations - they turned out so cute! So cute...they actually look like rusted metal. Very, very cool! These are so cute. Thanks for the inspiration. 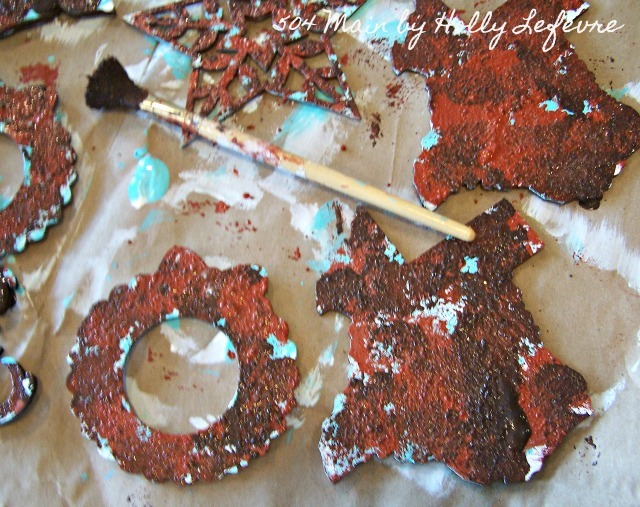 I would love for you to stop by diyhshp.blogspot.com and link this up to my More the Merrier link party. 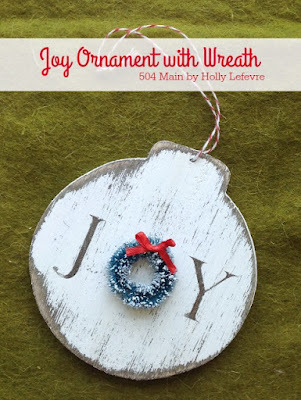 Love the fun pops of color, great diy ornament! Wow! Your technique really does look like rusted metal. These are unique and very pretty ornaments. How cool! I've never heard of that rust paste. 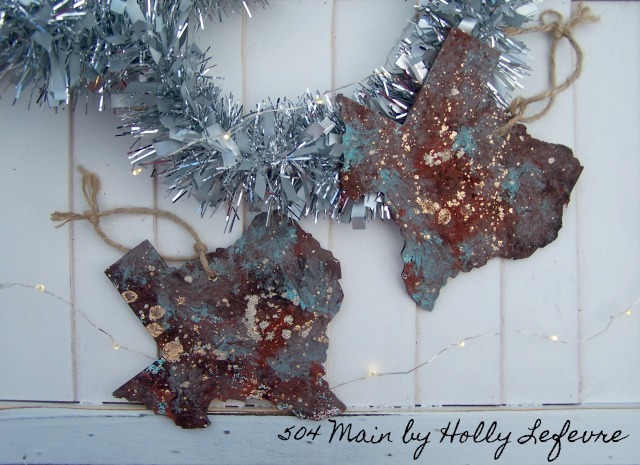 Your ornaments really do look like rusted metal! Thanks for sharing a great idea! love how you achieved the look with paint! 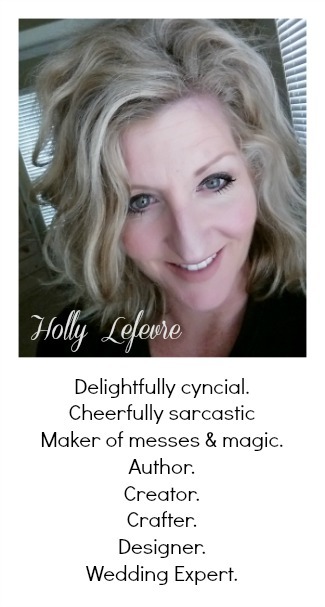 Holly these are absolutely fabulous! You just introduced me to new paints and techniques... so much fun ahead for me! My favorites are the angel wings and the star, but I love them all. I'm so happy you joined us again for another truly creative year. Holly, these are amazing! I honestly thought they were rusted metal. You have inspired me. I am hoping to get the chance to make some of these for this year's tree. I love the rusty and rustic look as well. So happy to be partying with you again this year! What a great paint technique Holly. 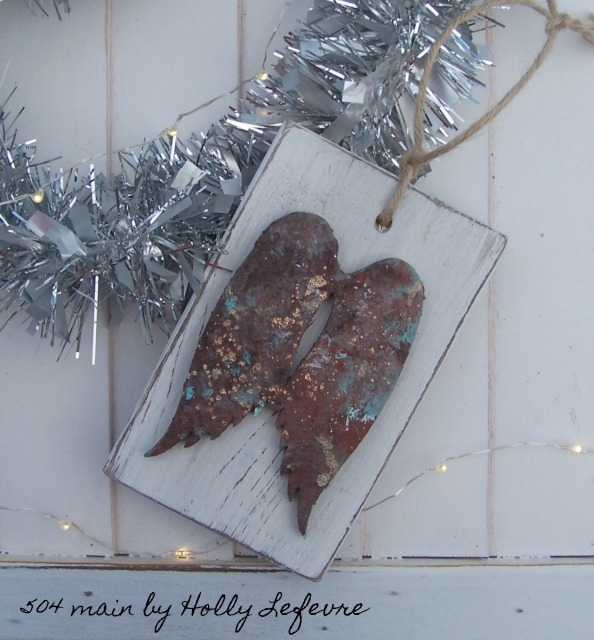 I've pinned to my Handmade Christmas board... this will be so popular! WOW! These are beautiful! Thanks for sharing! 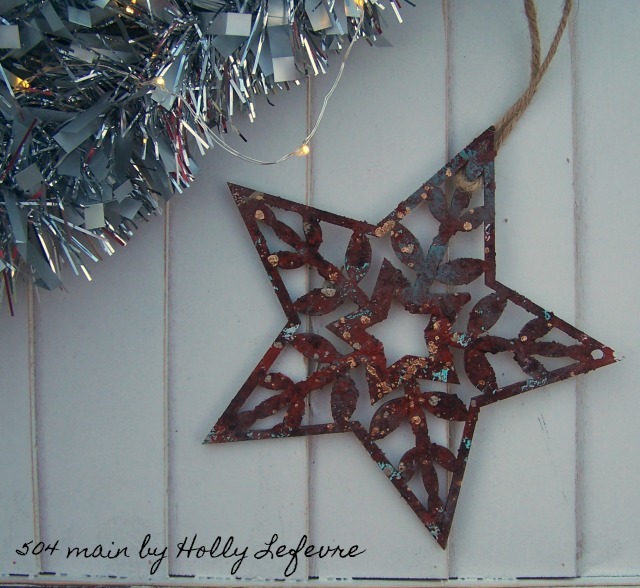 I love the rusted look of your ornaments. That star is my favorite! Thanks so much for the detailed tutorial, I can't wait to give this paint technique a try! Love it... so fun and festive! 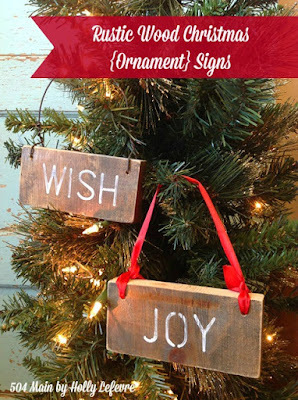 I love these rustic Christmas ornaments. So pretty! These are awesome! Love the finish you achieved. I love this technique! I need to get some of that rust paste. It looks magical!